One thing you need to know about my family is that my oldest son, Connor, is a huge fan of almost anything C. S. Lewis. Always has been. Probably always will be. He reads not just the fiction, but the non-fiction, and is always on the lookout for a title he doesn't yet own. 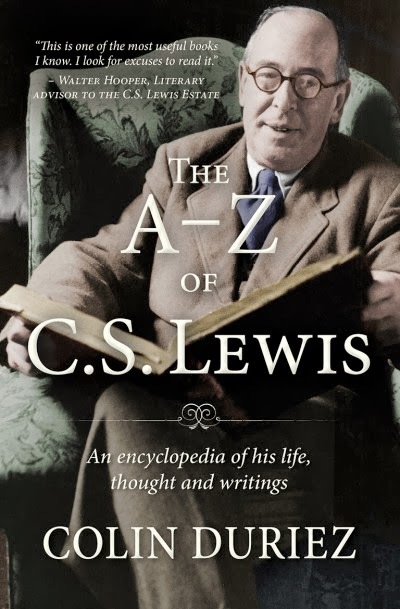 So, when the opportunity to review The A-Z of C. S. Lewis by Colin Duriez presented itself, it took me no time at all to decide if I wanted to review this. Of course I did. I didn't even have to read the book description to know Connor would be interested. I was right too. It came in the mail, I opened it and saw the front cover. So did Connor. He practically snatched it out of my hands, and I didn't see the book again until I threatened him today with, "I will NEVER EVER review something with you in mind if you don't give me back that book NOW." He brought it to me, and spent a good hour to an hour and a half telling me all the reasons he loves this title. Well, okay, we also discussed topics like what time he needs to be up tomorrow, and whether or not there is a book like this for J. R. R. Tolkien. What can I say, we're a bit distracted in our conversations. Published to coincide with the 50th anniversary of C. S. Lewis's death, this complete guide covers all of Lewis' works, from his literary criticism to Narnia. C. S. Lewis's work is widely known and regarded, but enthusiasts are often only aware of one part of his work-his children's stories and his popular theology; and yet he wrote so much more, including science fiction and literary criticism. This volume brings together all aspects of C S Lewis's life and thought. Arranged in alphabetical order, it begins with The Abolition of Man-written in 1943 and described as "almost my favorite"-to Wormwood, a character in The Screwtape Letters. This book will delight anyone who is interested in C. S. Lewis and wants to learn more about him, his thought, his works, and his life. So, a basic synopsis of what Connor had to say, mingled with my impressions after spend a bit of time leafing through and reading entries here and there. First off, this book is exactly what the subtitle says it is "An encyclopedia of his life, thought and writings." Don't let that word "encyclopedia" scare you though. Although I'm sure a huge, heavy encyclopedia volume (or two) could be written about Lewis, this isn't it. This is a nice, novel-sized hardcover book that you can read without exhausting your wrist and arm muscles. A great part of this volume is that after you get to Z -- the final entry is Zardeenah, a Calormene moon goddess in The Horse and His Boy -- there are lists of Writings of C. S. Lewis, Posthumous writings and collections, and a Select list of book about C. S. Lewis. As for the encyclopedia part, there are entries for all sorts of things, and the entries range from brief and matter-of-fact, to fairly lengthy descriptions that are actually fairly concise summaries of that particular topic. Connor loves that it doesn't mention every character in every book, or every milestone, so you don't get bogged down in excruciating detail. However, there is enough there that you can find many characters, events, people and themes. If you are looking for information about his writings (Narnia, Til We Have Faces, ...) there is a lot there. If you want to learn more about his friends (such as Tolkien), there is a lot there. Or if you want to see his thoughts about a subject (Romantic Theology) in a concise manner, that is there too. This is a fun book to just pick up and thumb through, reading whatever catches your fancy. Nice review, Debra. We have this book and I like it as well. There is so much in it for such a 'small' book, but overly much. I'm sure a few volumes could be written about C. S. Lewis!